The National Centre for Cooperative Education, New Delhi to conduct 3 days leadership training camp at New Delhi for Board of Directors of Cooperative Society/LAMPS of State. The initial training to the selected Board Members were given at the for the training camp of which was held here at the Arunachal Pradesh Cooperative Union office at Polo Colony here today wherein the Board of Directors of the various cooperative Unions and Lamps were present. Jt. RCS R.D. 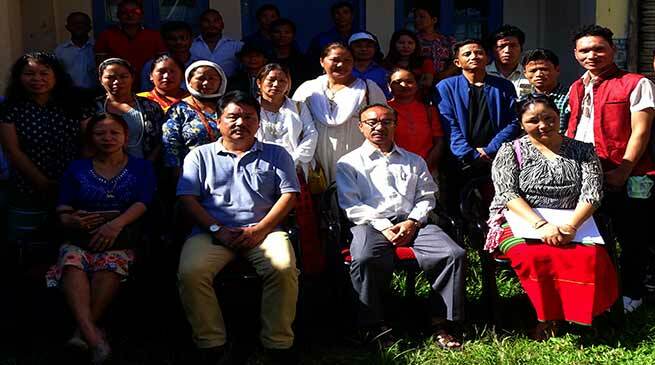 Thongon (Development), Principal Arunachal Pradesh Cooperative Training Centre Techi Kaku, APSCU CEO Pelbang Tayeng, Bassarnallo Sangtam Ajin MPCS (BSAMPCS) Chairman Nabam Nekil among other were present on the occasion. BSAMPCS Chairman Nabam Nekil said that a total of 38 members from ten district of state of various Cooperative Societies and LAMPS would be attending the three days training programme which would held at NCUI at Haus Khas, New Delhi from 8 to 10th November. The main motto of the training would be focused on leadership development and improved efficiency so as to they develop for their organisation in their respective areas of state. Jt. RCS R.D. Thongon while said that The training would increase the knowledge and skill of an employer for doing a particular job. These training are vital for a successful business which would help to carry out their business to their best of ability and also add to the productivity and quality of work. The day long interaction programme emphasis to become a good businessman in the eastern most state of the country.